So today is your birthday. I still can’t believe you’re not here. It’s been years since I’ve celebrated your birthday with you. The last time I remember was your 21st. I’m sure I was around for the 22nd and 23rd, but after that I moved away. This has been a tough week for me and in a way I’m surprised because like I mentioned it’s been years since I celebrated one of them with you. Those people who’ve been with you for most of them are having a spaghetti dinner for you tonight. I wish I could be there. Actually what I really wish is that I could call you up and say “ha, ha, now you’re 35 too, we’re so old.” But you’ll never be old, just plastered in my memory forever as a 34-year-old expectant mom. If I try real hard I can still see you waddling in the bedroom with that piece of cake for me. Why is it again that you were supposed to be on bedrest but were serving me cake? I’m sure a few people would have scolded me for letting you do that. You know I really believe that you are still with me. A few weeks ago as I was falling asleep I thought of you. I thought about how I was on vacation and too busy to call you after the babies were born. I had two days that I could have said congratulations and I loved you but I chose to wait until I got home. By the time I got home it was too late. I don’t really have any regrets about our friendship except for that one. I went to sleep that night thinking about it and then you came to me in a dream. It had been a long time since I’d dreamed about you and I don’t believe it was coincidental that I saw you on that particular night. I wonder what you are experiencing these days. Your mom talks about Heaven a lot. I try to think of what Heaven is. I like the way Sylvia Browne describes the other side. Basically, if I’m remembering correctly, she says it is just layered on top of this side. That we are totally intertwined and us humans are just too “closed” and stuck in our life drama to see it. So I’d say that you are floating around seeing and feeling the underlying love in everything. I’ve also wondered if you’re working some sort of magic out there too. So many of your friends have gotten pregnant since you left, including friends who had struggled for years (like you did). Not that you are the stork or anything, but maybe you’re just helping people get the timing right. I know some people will read this and think I’m crazy. I’m sure there is a logical explanation for so much of what I experience as you still being here. On this one I don’t want to be logical, I want to be hopeful and faithful. I’ll cling to the idea that no one really knows for sure. I’ll count my frogs, my dreams, and the latest baby epidemic as gifts and messages from my favorite angel. So keep them coming and let me hold you tightly in my heart until we meet again!! I love and miss you. 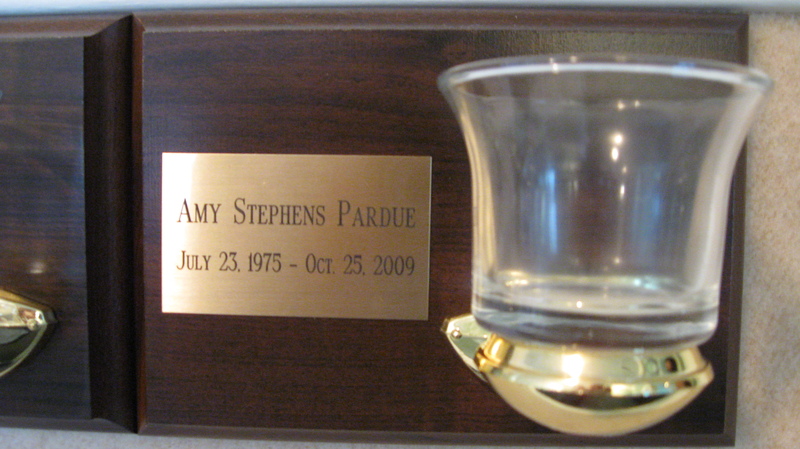 Happy 35th Birthday, Little Mama (maybe that would have been my nickname for you)! Thank you for this post. I didn’t think about all of us who are now expecting but it is true. Lots of us are…who have had lots of trouble getting there. Praying I can let down my human guard enough today to have one sprinkling of heaven come our way. 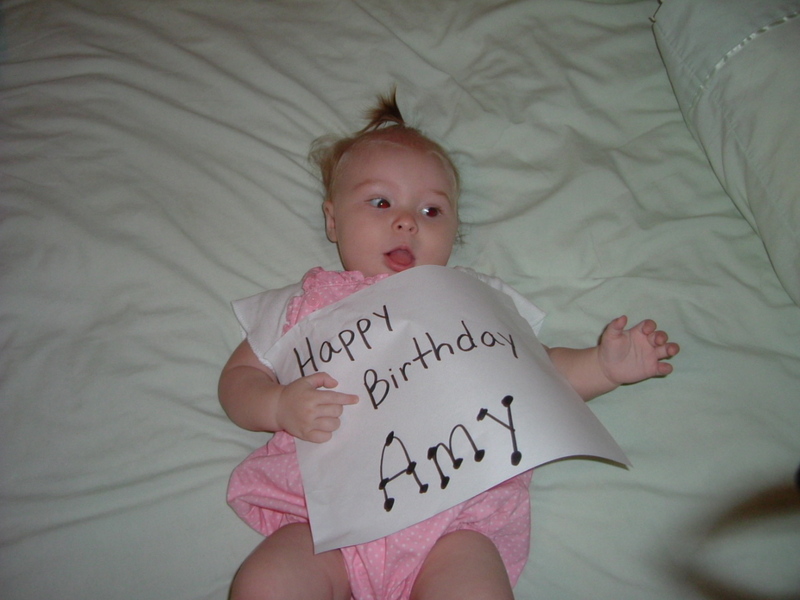 Happy Birthday Amy. I only know of you through Leslee. She keeps your Spirit alive and well. “…I don’t want to be logical, I want to be hopeful and faithful.” -sometimes this world needs a lot more Hope and Faith than it does Logic. Thank you Leslee for getting myself out of “me” this morning and focuses on more important things. I’m Amy’s sister and I love reading anything Leslee has written but most especially when she writes about Amy. I love what you wrote and I agree completely that she has found a way to show us her presence and be part of the small miracles that we see around us..I’m not sure if she can make them happen but she has an inside connection to the One who can and we all know how persuasive she can be. 🙂 I wish all of Amy’s friends could have been with us last night as we gathered as a family like we normally would have to celebrate a birthday and we had Amy’s favorite dinner that my mom makes. Just like everything about the last 9 months, it was bittersweet but just being together made it easier and after dinner we had cake and watched some of our old home movies, some of which I don’t think I had ever seen. Amy was 10-12 in most of the movies we watched and every single shot she was in, she was smiling and happy. At that age, you love being on camera and there is no self-consciousness that develops in the pre-teen years so she was just completely herself, uninhibited. She was roller-skating, dancing, playing with her cat and just being silly. We knew we would cry yesterday but didn’t know a lot of those tears would be tears of laughter which we did during most of the videos. It was a perfect way to remember her on her birthday and see her living life to the fullest and know that she had a lot of joy, love and laughter in her 34 years and we are so lucky to have been part of it. Thanks Candie for this comment. I’d love to see those movies sometime! I was at a wedding last night and got out on the dance floor to dance to “Holiday” by Madonna and I thought of Amy and of course got chills up and down. I’m pretty sure she was dancing with me! !